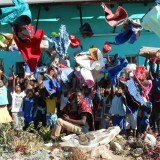 HOW TO CONTRIBUTE: Zimkids receives funding from our U.S. 501(c)(3), Zimkids Orphan Foundation. Tax-deductible donations can be made by mailing us a check made out to Zimkids Orphan Foundation at 18 Roxbury Mountain Road, Hobart NY 13788, or by credit card by clicking on the donate button below and following the instructions through a secure site operated by Paypal. Bring your school, religious institution, arts group or civic organization into the Zimkids family by arranging for a visit and speaking engagement by founder, Dennis Gaboury, who can bring with him dolls made by the children, each accompanied by a biography and photo of the dollmaker. He can also set up Skype conference calls with the children in Zimbabwe. Depending on your location and timing, Dennis will be accompanied by Tinashe Basa, the director of Zimkids. Contact Dennis at dennis@zimkids.com or dennis.gaboury@yahoo.com. We’re also are looking for used but usable laptops for our educational program. And while we’ve been blessed by amazing donations – of blankets made by our Texas gogos, of shoes from the Buckner Foundation, and underwear from individual donors – we never have enough of such essentials, or of school supplies, art supplies, or bandaids. The US Africa Children’s Fellowship provides us with container space each year. So if you or anyone you know can arrange such donations, please contact us. 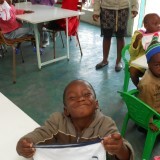 Look at the smiles such simple things bring to our orphans.